RICH SOURCE OF VITAMIN C: has four times that of orange and eight times of a tomato. Organic Amla Powder also contains the most stable and bio-available forms of vitamin C, Ascorbic acid. AYURVEDIC HERB: Pacifies Vata, Pita, and Kafa. Builds immunity and balances digestion. Amalaki Fruit Powder also Promotes detoxification and a very high source of anti-oxidants. Natural De-tox and rejuvenation agent. Rich in Anti-Oxidants and also gently helps in elimination. 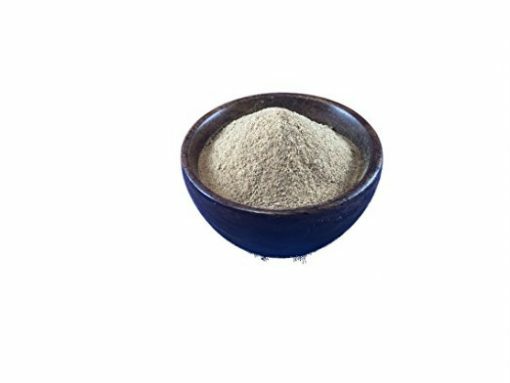 ORGANIC AMLA POWDER HELPS IN SUGAR METABOLISM: Organic Amla Powder also contains chromium, a mineral that regulates carbohydrate metabolism and may make the body more responsive to insulin, helping to keep blood sugar at healthy levels. PURE AND EFFECTIVE: 100% Vegan, Certified Organic and Non-GMO. 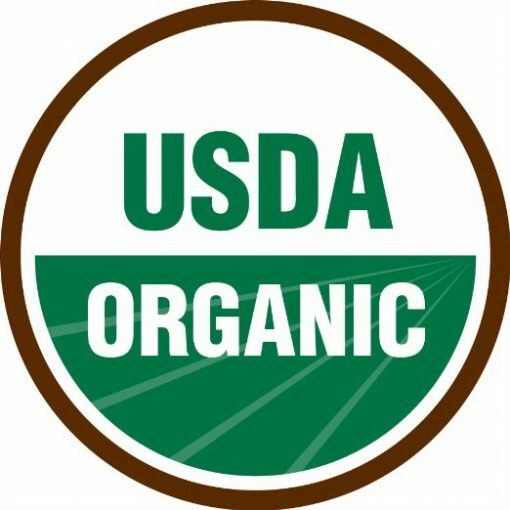 Contains no chemical pesticides, artificial additives or preservatives. Organic Amla, also known as Indian gooseberry, has many medicinal properties and has been used for thousands of years as one of the most effective and nutritious herbs in India. Organic Amla Powder is naturally sour and can be a great addition to your smoothies or sprinkle on your salads to add a zing! Other uses of this Amalaki fruit powder include making face packs and scrubs to rejuvenate your skin. 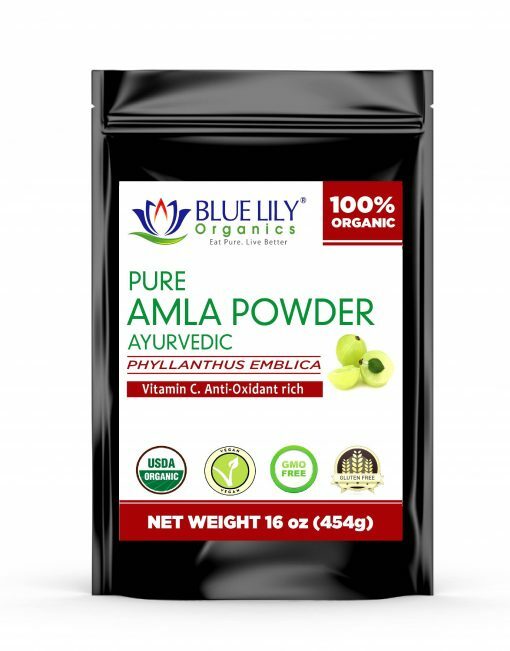 Blue Lily Organics ground and organic Amla powder have been in use by ancient ayurvedic methods with many health benefits. This powder can be used to soothe your throat during a sore throat and cold because it is full of vitamin c.
How to Use Amla Powder for Hair: Make a smooth dough by mixing about 2 teaspoons of Organic Amla powder with warm water. Add 1 teaspoon of honey and 2 teaspoons of yogurt. Mix well and apply to the hair. Let it rest for half an hour before washing it with hot water. How to Use Amla Powder for Digestive: People like Amla play such an important role in the digestive process and instruct the body to set up its own support mechanisms. Ayurveda traditionally recommends testing herbs. Like Triphala, Amla powder can be infused at night or standing in warm or cold water. 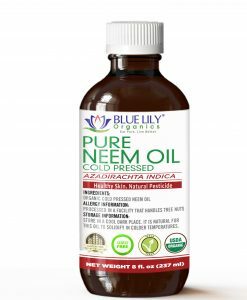 In some cases, taking Amla in milk, ghee, or another carrier may help steer the herb to a specific tissue or organ, or result in some sort of systemic support. This Amalaki Fruit powder is made with dry Amla fruit under low heat, ground and packed fresh for you.